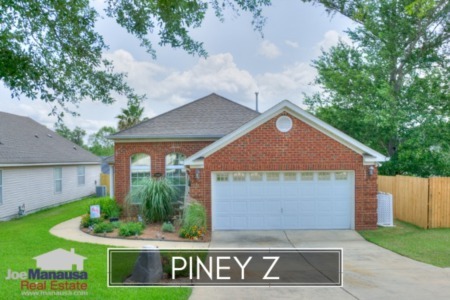 Piney Z is a wildly popular neighborhood in NE Tallahassee. Featuring three and four bedroom homes priced just above Tallahassee's median, it's no wonder that Piney Z often times ends up on the list of the 5 top-selling neighborhoods in Tallahassee. The following are the current Tallahassee MLS listings in Piney Z. This Piney Z neighborhood report includes charts and graphs that display average home prices, home values, and home sizes, as well as a list of the most recent 1,000 closed home sales in Piney Z. For each of the three real estate graphs found in this Tallahassee housing report, you will find the number of closed home sales for each year (red columns, measured on the left vertical axis), and an important real estate statistic shown in blue (measured on the right vertical axis). The graphs and the closed sales table will be continuously updated into the future (meaning bookmark this page if you always want to know the current status of homes in Piney Z). Average home prices in Piney Z moved higher in 2018 to $241K. Expect this trend to continue as Piney Z homes continue to sell fast. Currently, there are 22 homes for sale in Piney Z and 8 are already under contract. Properly marketed homes in Piney Z sell immediately as there remain far more buyers than sellers. Piney Z home values have risen more than 6% this year, which is on pace for a 10% annual rate of appreciation. 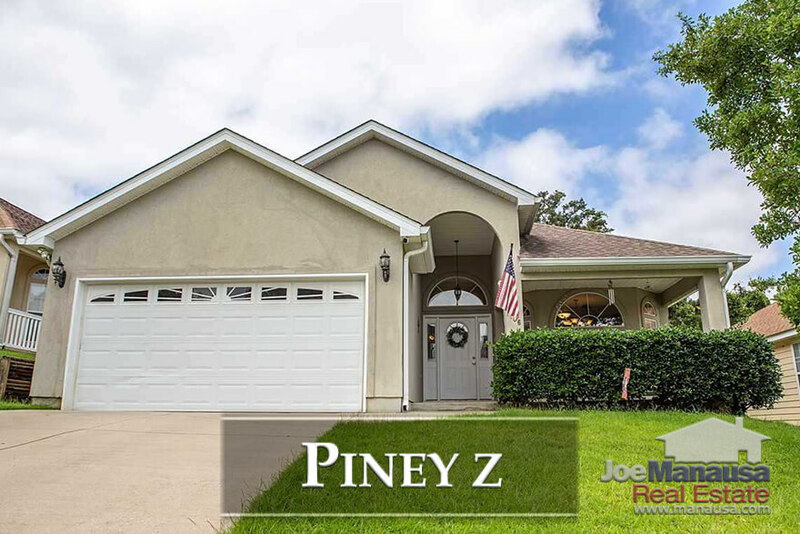 Piney Z homes are hot! Currently, the average home value in Piney Z is $135 per square foot. The average home size sold in Piney Z typically falls in a range of 1,700 to 1,900 square feet, and this year is no different. The 38 homes sold thus far in 2018 have averaged 1,788 square feet. The following list shows the most recent 1,000 home sales in Piney Z. Note that you can reorganize the list by simply clicking the column heading for the data you wish to sort by. 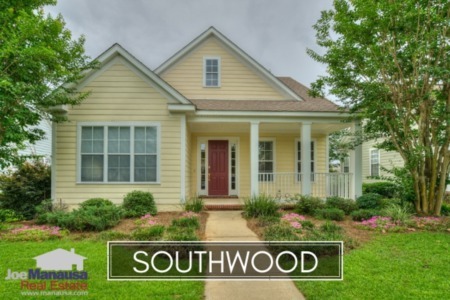 This concludes our July 2018 update on home sales in Piney Z, please give us a call at (850) 366-8917 or drop us a note if you have questions about this neighborbood in NE Tallahassee. Why not hire Tallahassee's Top Realtor? 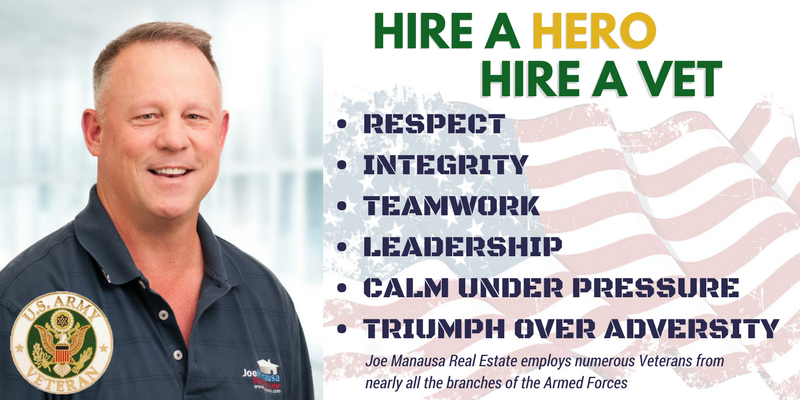 Here's what thousands of people are saying about working with Joe Manausa Real Estate, you can see their reviews reported on Google, Facebook and Zillow right here: http://www.manausa.com/testimonials.